There are several important factors in choosing an energy storage capacitor for a coilgun. The PE (potential energy) depends greatly on voltage. Note that PE is proportional to voltage-squared, so it is a great advantage to use higher voltages. 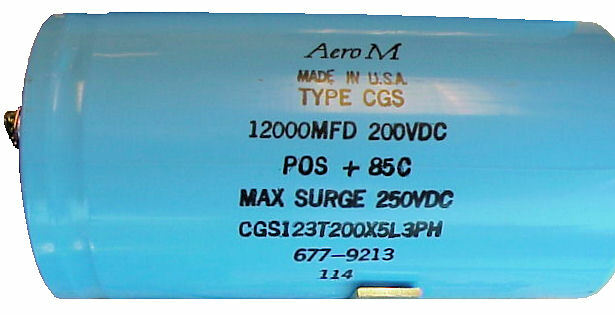 Costs are favorable in the range 100 – 300 wvdc (working volts of direct current). We recommend comparing capacitors on the basis of “cost per joule” when considering them for purchase. We can choose between standard power-supply filter capacitors, and pulse-rated type. The pulse-rated will have lower ESR (equivalent series resistance), and larger terminals. However, the standard aluminum electrolytic capacitors have low-enough resistance to achieve an under-damped circuit, and are much more commonly available. To estimate the desired capacitance for the LC tuned circuit, we plug in approximate values of the time period and probable inductance. We expect low inductance, in the range 1 – 100 uH, and time t in the range 1 - 4 ms. This is a very broad range, so we chose the middle value of capacitance of about 10,000 uF.